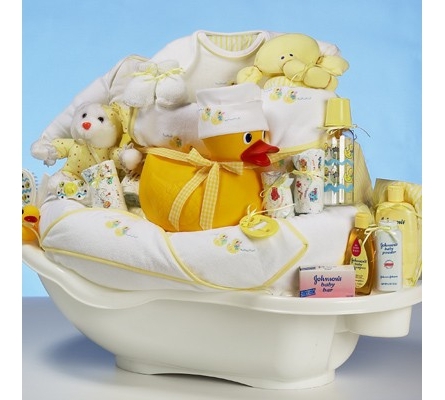 When it comes to baby shower gifts, few rival our Shower Deluxe Baby Gift for beauty, quality and overall impact. This is a large and impressive gift that is designed to be noticed and appreciated, not only by everyone at the shower but also by the new parents after baby is born. That’s because it overflows with premium quality items. 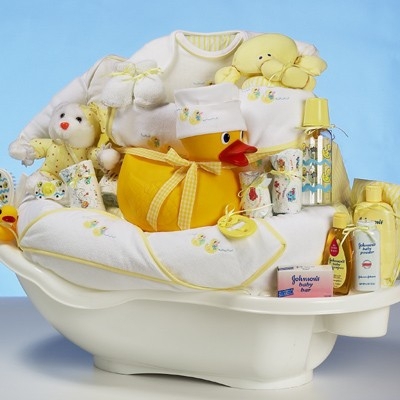 From the pristine white rub-a dub bathtub, to the numerous 100% cotton layette items, to the included J&J bath & skincare products, this gift has it all. So when you want to make a "big splash" at the shower or after the baby is born, choose the remarkable Shower Deluxe Baby Gift.